perhaps a Marine huddled here in the cold. No one had to ask or beg or implore me. I’m proud to stand here like my fathers before me." "My Gramps died at Pearl on a day in December." And now it’s my turn and so, here I am. But my wife sends me pictures, he’s sure got her smile." The red white and blue…an American flag. to ensure for all times that this flag will not fall. "But isn’t there something I can do, at the least? Give you money?" I asked, "or prepare you a feast? This is a brief poem I wrote to extend my sincere appreciation and holiday wishes to active and former members of the Armed Forces, and to share a bit of love and holiday spirit. Please feel free, if you see fit, to post or forward this poem in any form or venue with my blessings. Thanks for helping to share the holiday spirit and the thanks of a grateful nation. In loving appreciation of the countless Americans who have and continue to serve in the Armed Forces, and those who gave their life for their country. Your sacrifices will never be forgotten. We look forward to the day you come home. 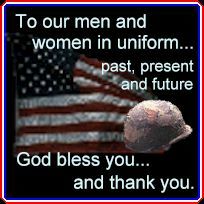 God bless and keep you always, and God Bless America!